If you are on our Growth Plan, you have access to Custom Field audience targeting (Beta). This allows you to use custom field data that has been captured either via Privy forms or included through contact import into Privy to create even more targeted segments. The information collected using custom form fields and/or hidden form fields is called detected or captured attributes. This feature allows you to use these detected or captured attributes as audience targeting conditions to further personalize visitor’s experience on your site. 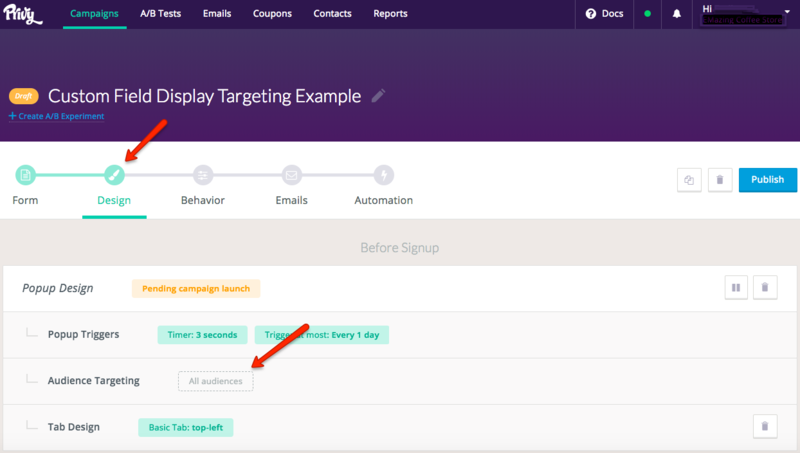 To access Custom Fields Audience Targeting, you will need to create a campaign and then go to the Audience Targeting within the Design section of the campaign. From the audience targeting builder, choose “custom fields” as the property you would like to use. Choose the custom field you want to use from the field drop-down, and choose whether the field type is a text field, a number field or a list. The "Field" drop-down will auto-populate with the different attributes you are currently tracking with hidden fields and custom form fields for you to choose from (favorite color, age group, location, etc). The field options will be based on the attributes within your Privy campaigns that you are currently capturing. For example, you can choose Smile.io as the custom field with your integrated Smile.io rewards account to target based on reward point value or VIP tier. Next, you’ll want to choose the “Operator” and the “Value”. For example, a number field that is “greater than” “10”, or a text field that “is” “blue.” This even applies to something like targeting parents where the field “has children” has a value of “true”. The value input is what your site visitor indicated as their choice on the attribute form, so you will be able to type in whatever value applies to that Custom Field option. Although these values are not case sensitive, they will otherwise need to match the customer indicated value exactly. Important Note: The detected attribute fields that Privy will import differ depending on which account integrated account or CSV file you are using to import the contact data. To learn more about which fields Privy will import from your integration or CSV, please refer to our knowledge base documents specific to your integrated account.